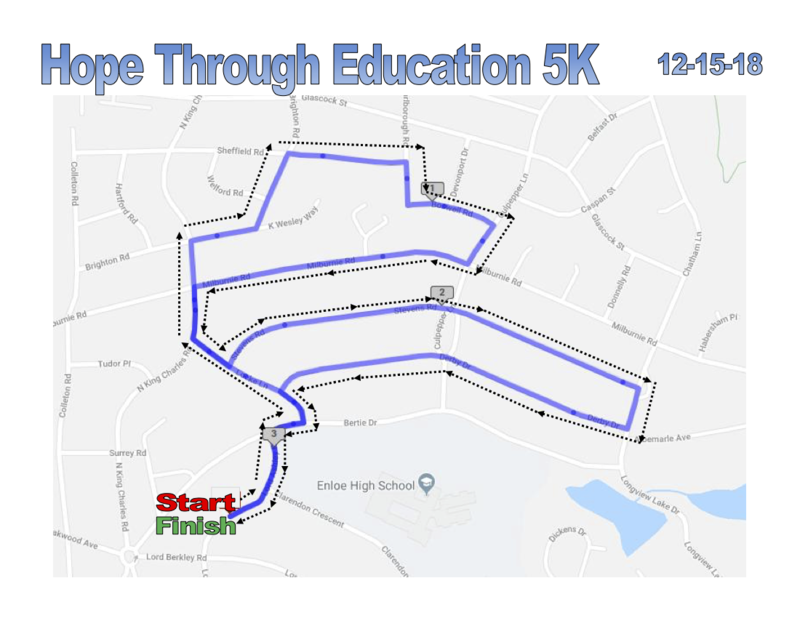 Welcome to the first ever Hope Through Education 5K! The race is a first-time partnership between Saint Augustine's University and Fellowship Raleigh Church, neighbors in downtown Raleigh, to raise money for the 1K Scholarship at Saint Augustine's. We at Saint Augustine's and Fellowship Raleigh desire to see the flourishing of the local Raleigh community by supporting this scholarship fund and the students who will benefit from it. The 1K Scholarship provides financial support for students who would not be able to return to the university without some form of external financial support. Proceeds will directly benefit the scholarship fund. More information can be found in the "1K Scholarship Information" tab. Click here to check out the course on Strava! When registering, entrants may choose to enter the event as a competitive or recreational entrant. Competitive entrants will receive an official finish time and be eligible for awards, while recreational entrants will not receive an official time in the results and are not eligible for awards. All finishers will be able to see their finish times on a digital clock at the finish line and will receive a race t-shirt. All entrants may change their registration category on race morning for no additional fee. The race is sanctioned by the USA Track & Field. As a result, for the safety of all participants, no wheeled vehicles, including baby joggers, will be allowed. There WILL BE race-day registration! Snacks: Available as soon as you finish! Packet pick-up will happen on race-morning at check-in. Check-in, race bib pick-up, and t-shirt pick-up will occur in the fellowship hall of Fellowship Raleigh, beginning at 7:45 AM. Signs will be posted to direct participants to the parking location and to the check-in location, all located within a short walk of the start/finish line. Award winners will receive gift cards from our generous award sponsors, Runologie and Two Roosters Ice Cream! For more information, one can contact the race committee at HopeThroughEd5K@gmail.com.